It is not often that the Oklahoma State Legislature makes me proud these days. However, I was very pleased when I saw on the front page of the Tulsa World that noted historian, Civil Rights activist, and native Tulsan Dr. John Hope Franklin was being honored with a portrait to be displayed at the State Capitol. I first heard about Dr. Franklin in 1996 during my Black History course at Tulsa Community College. In that class we were using Dr. Franklin’s classic From Slavery to Freedom as our textbook. I swelled with great proud when I found out that Dr. Franklin was from Tulsa and that he also graduated from the “pride of the great Southwest” Booker T. Washington High School as I. Several years later in 2003, while working with the Reparations Coordinating Committee fight for justice and human rights for the suviviors of the so-called 1921 Tulsa Race Riot, I was blessed to work and visit with Dr. Franklin on several occassions. Once (as pictured below with Dr. Franklin,Prof. 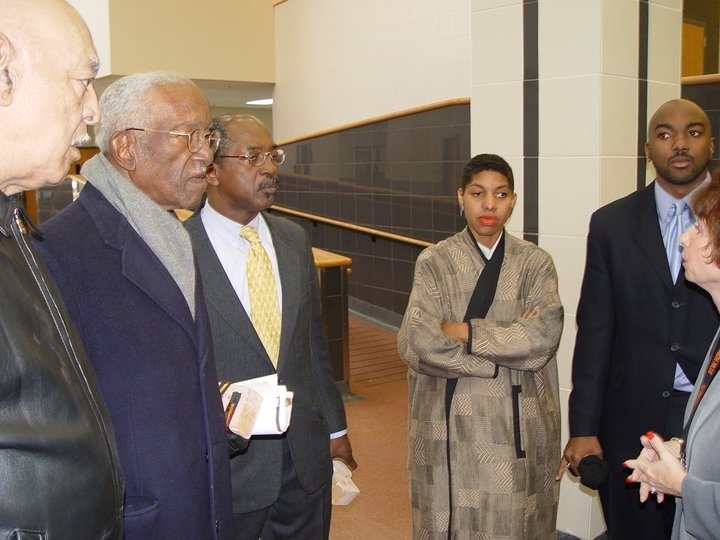 Charles Ogletree of Harvard University, Regina & Ed Goodwin, and me) while in town, Dr. Franklin wanted to tour the brand new Booker T. Washinton High School building. Dr. Franklin was eager to see if the school’s tremendous Black history was given proper treatment, and discussed several items with the school adminstration upon entering the building. I even got to travel with Dr. Franklin to Washington D.C. and witnessed from the front row his testimony to Congress about the so-called 1921 Tulsa Race Riot and why reparations for our survivors were necessary. Without a doubt, that was one of the highlights of my life. Dr. Franklin you deserve this great honor and I hope that your memory, great works, and powerful legacy continues to inspire generations to seek truth, justice, and equality as you inspired me.